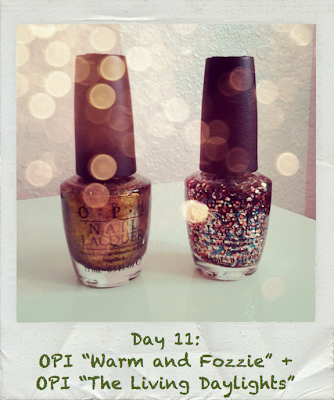 What I Blog About When I Blog About Books: 11th Day of Christmas: OPI "Warm and Fozzie" + OPI "The Living Daylights"
11th Day of Christmas: OPI "Warm and Fozzie" + OPI "The Living Daylights"
Christmas is only a few weeks away and today I have for you another nail combination that involves OPI "The Living Daylights" from the Skyfall collection. I layered it over OPI's "Warm and Fozzie" from last year's holiday collection and I really like the turnout. OPI "Warm and Fozzie" is my favorite browns. 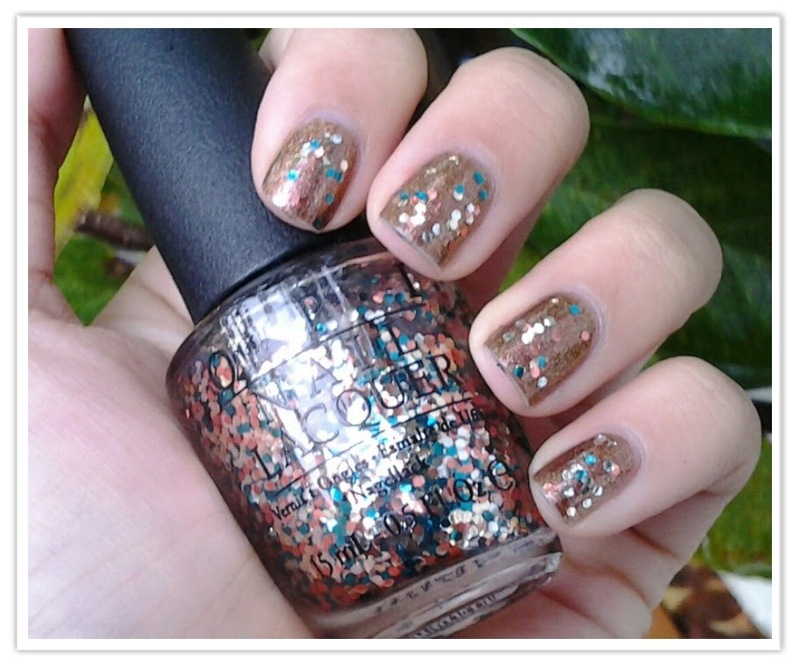 It has an amazing foil with interesting multi-colored glitters. If you want to see more photos you should can find the complete review I did for it a few weeks ago here. OPI "The Living Daylights" is such a fun glitter to layer of polishes. 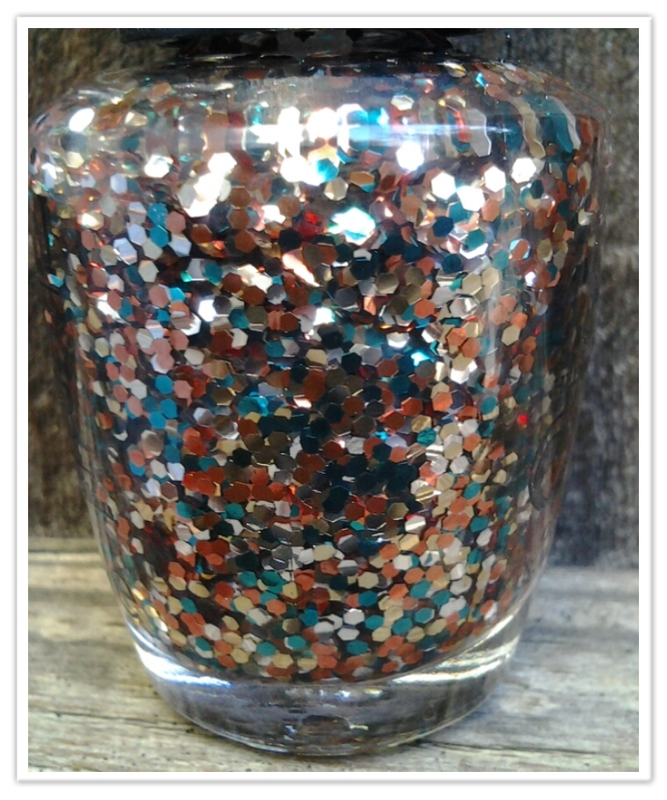 It has silver, blue, and bronze glitters that compliment a variety of different base colors. I have already done two holiday-themed notd posts with this polish, one over a golden foil (which you can find here) and one with it layered over a deep red creme (which you can find here). I am loving this combination. "Warm and Fozzie" looks even more amazing under "The Living Daylights" than "Just A Little Rosti At This" did. The extra shine and foil properties of "Warm and Fozzie" make this nail combination eye-catching and fun to stare at in the sun. The only thing that bothers me about this manicure is that I couldn't get the glitters from "The Living Daylights" to lie flat on my nail. The brush of that polish is always full of glitters that want to overlay one another. However, otherwise, I am enjoying this manicure a lot. We are almost halfway through these holiday-themed nail posts and I hope you're enjoying them so far!